If the Friday night pre-Passport event is a barometer for this weekends Passport. All indications are that it will be another stellar year for Woodinville wineries. The welcome to HOLLYWOOD wine tour kicked off this weekends Passport to Woodinville. Eight wineries opened their doors to the public. Starring: Adams Bench Winery, Brian Carter Cellars, Chandler Reach Winery, Hollywood Hill Vineyards, J. Bookwalter Winery, Matthews Estate, Northwest Totem Cellars & Woodhouse Family Cellars. 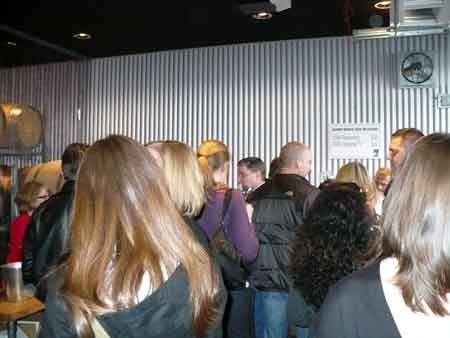 Every winery was packed this evening with lines of people waiting to taste local Washington wines. Some of my favorites included Myth, a Cab. Franc & Merlot blend from Adams Bench, Roussanne, a single varietal white from Hollywood Hill Vineyard, and NW Totem Cellars had a number of blends that were fantastic. Including Potlatch and Low Man Red. If you are a dessert wine fan and even if you are not don’t miss NW Totem Cellars Late Harvest Voignier. Passport attendees get ready. Lines will be long but well worth the wait! ← NW Wine Country Home Almost Ready! You liked some of my favorites tonight as well. I ended up staying a full hour at Adam’s Bench enjoying their Cab blends as well as the excellent company of the owner/wine makers. I liked the Low Man Red at NW Totem Cellars but I agreed with the pourer that the Potlach will be much better after being cellared for at least a couple of years.